Pretzel Logic's Market Charts and Analysis: SPX Update: "And the Wisdom to Know the Difference..."
SPX Update: "And the Wisdom to Know the Difference..."
I recently received a question as to what my near-term preferred count is, so I thought it important to reiterate that my stance in that regard hasn't really changed since April 27, and I remain basically neutral on the near-term pattern. 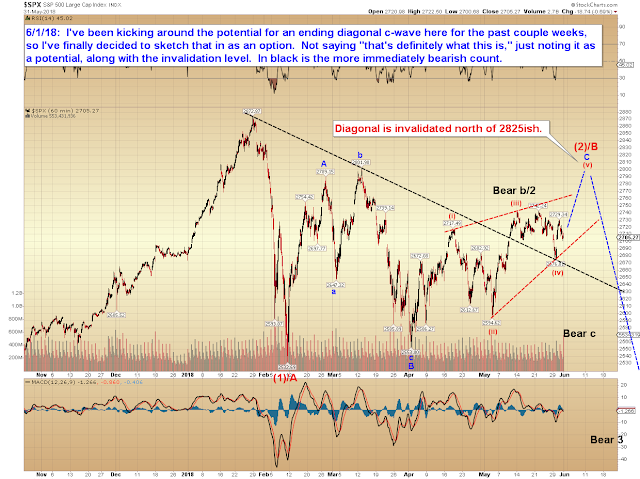 I remain bearish about the longer term, but I'm not presently certain the short-term path that we'll take to get there. 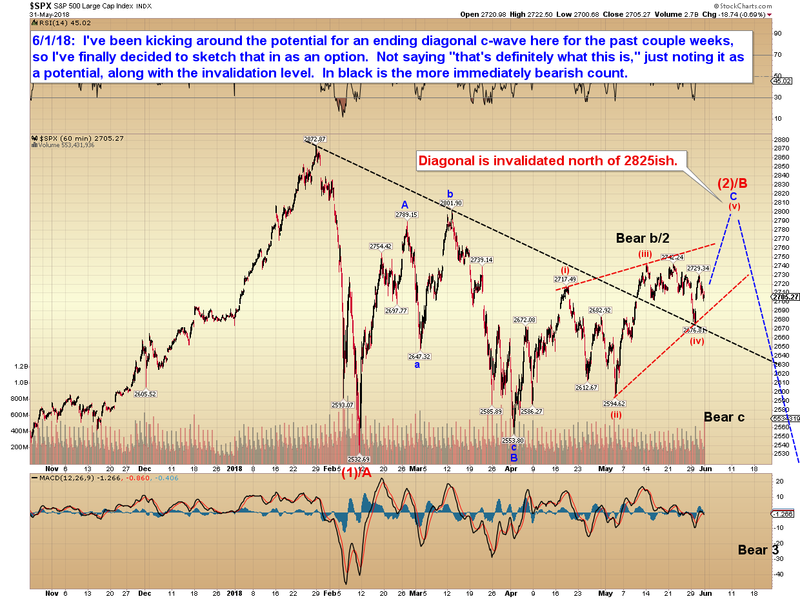 There are times the market is reasonably clear to me, and at those times I present my preferred outlooks and targets. At other times, the market has multiple options and no clear path seems to have an edge -- and during those times, I would rather watch and wait than try to predict something just for the sake of predicting something. I actually believe that the approach of "always needing to think we know" is counterproductive. The reality is, every day is not a tradeable pattern, and there are times to expand capital and times to protect capital. Knowing the difference is vital, because overtrading when you can't find an edge is a sure fire way to grind your account down. As it turns out, shifting my near-term stance toward neutral at the end of April was probably the most productive thing I could have done On April 27, SPX was trading at 2666, while yesterday it closed at 2605. In more than a month, it's only changed by 39 points in absolute terms, and has ground up a lot of traders in the interim. That grinding could have been avoided by awaiting more clarity, which has been my intention this entire time. Long-time readers know that I believe one of the mistakes made by novice practitioners is to believe that one "should" attempt to predict the market every minute of every day, when in reality this is impossible. The market sometimes provides us with an edge, and if I see such an edge, then I publish it. Other times, I will publish a couple options with some "if/then" equations. Still other times, the odds seem to favor nothing in particular -- perhaps those odds are 6 to 5, or even money -- and there's really not much one can do during those times, besides wait them out. That's essentially where we still find ourselves at the moment. As I mentioned last update, bulls have continued to hold the prior breakout zone, so that's one zone to watch, and may be possible clue. In conclusion, the market really hasn't done anything noteworthy over the past month, so it's still something of a "watch and wait" zone, but at least we do have a few things to watch. Trade safe.